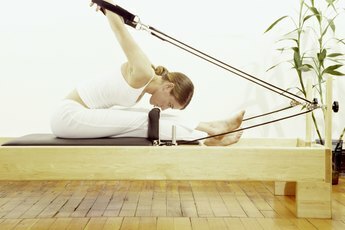 Pilates incorporates multi-muscle movements to strengthen your arms and your entire body. If you love the challenge of Pilates workouts you might wonder which exercises you can do to focus on specific body parts. For example, if you struggle with keeping your arms toned, having an arsenal of Pilates arm exercises could fight the flab as well as define your arms for a look that will have you going sleeveless more often. Full-body exercises are really the focus of Pilates, but they can still tone your arms. Most Pilates exercises involve several body parts at once, sometimes incorporating whole body movements, and placing the focus on core strength first. The exercises are controlled and it is the concentration on controlling your movements that make Pilates so effective in toning your arm muscles as well as the rest of you and improving your flexibility and strength. The total body movements you do during any Pilates routine will not only increase strength and flexibility, but they'll also develop coordination and improve your circulation and posture, too. Building strength and stability with Pilates exercises will help you function during a normal day of lifting and hauling things like groceries, laundry and kids. Pilates also helps you with things like your golf swing or minimizing or eliminating neck and shoulder pain from working at a desk all day. Even though there are no Pilates exercises that single out your arms, there are plenty of movements that incorporate your triceps, biceps and shoulders. Plank movements require you to balance on your arms, engaging those muscles in the process. The hundred gets your arms into the act because it involves holding them up off the floor and squeezing the muscles under your arms. Even holding your arms up towards the ceiling while doing leg circles involves challenging those muscles to keep your arms taut and upright. You can choose from many Pilates exercises, but you can single out the upper body exercises and put them together for an effective routine that will enhance the strength and flexibility in your arms and the rest of your upper body. Include moves like the hundred, roll ups, crisscross, swimming, saw and the mermaid, doing two to three sets of six to 10 reps each. Incorporate a few sets of planks, bridges and rockers, too, as those exercises also include arm movements. Will Yoga Help Me Tone Up?